Fake accounts on Twitter are very common these days. Twitter recently claimed they deleted millions of them and even the stock price fell more than 15%, when they released their user rates . I personally believe, deleting fake accounts from the platform is actually very good in the long term of any social media platform. However, it does not seem to be enough. I am only occasionally on Twitter, but today I have seen the common cryptocurrency scam posts on another level. 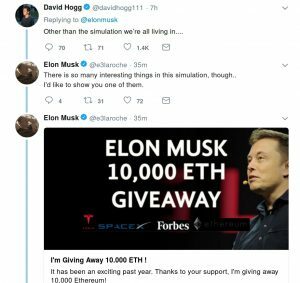 Usually, when you see fake accounts they answer to a very common account like Elon Musks, using the same Name, Picture and only a slightly different Twitter name. Twitter recommends looking at the verified sign, but as the figure below shows, that is not enough. I suspect that they hacked this account and use them now for cryptocurrency scam posts. Twitter really needs to take care about this problem. It’s not only annoying for all users to see those posts under almost every post of people like Elon, it’s also dangerous for people seeing this the first time. And given the fact, that those posts are still so common means it’s still profitable. That’s why fake accounts have to be harder to get and faster to be deleted from Twitter. And last but not least, people should not fall for this scams. Nobody gives you free money, never ever.